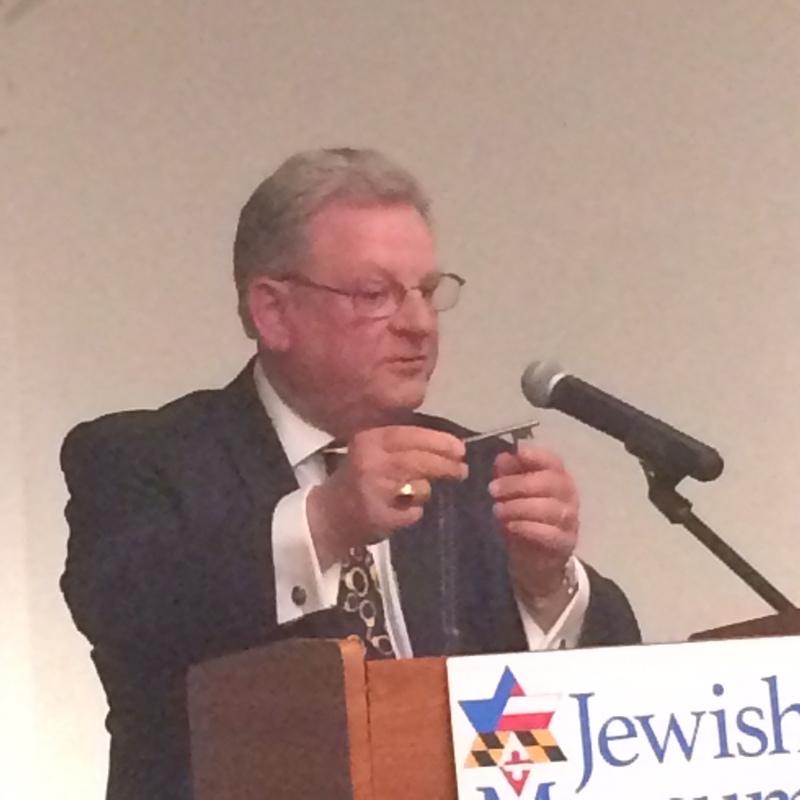 We held a member/donor preview of the exhibit on June 21. 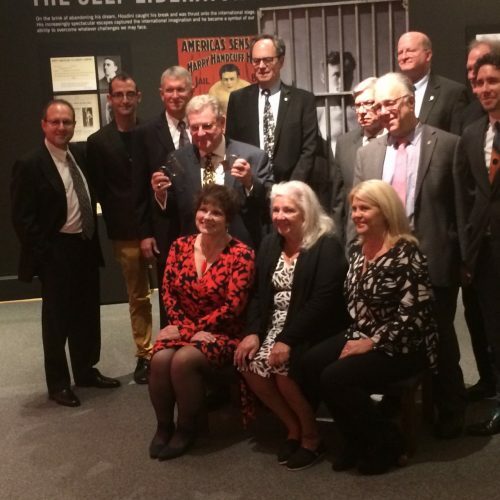 In addition to our members and project donors we (as is customary) invited a select group of public officials to the event. 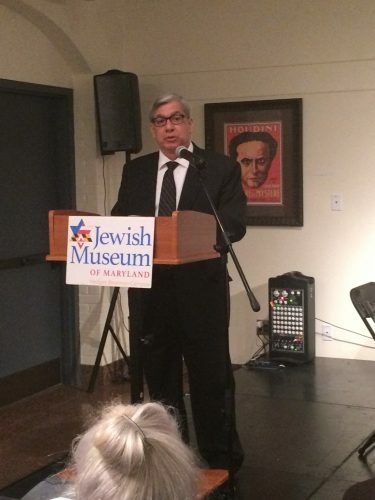 Among these was Maryland’s Secretary of State, John Wobensmith, who had been kind enough to participate in our opening for Yad Vashem’s Beyond Duty exhibit last February. Secretary Wobensmith showed up for the Houdini preview carrying a folio. He said “my grandfather was Harry Houdini’s patent attorney and I brought with some correspondence between them.” I admit that this seemed like such a strange coincidence that I barely knew what to say. Given the evening’s busy schedule, I did not have time to peruse the folio, but the Secretary invited me to his office in Annapolis to take a closer look. Last Thursday I was able to make a visit and what I found was astonishing. The Secretary had inherited not one small folio but at least three binders of material related to his grandfather’s work. 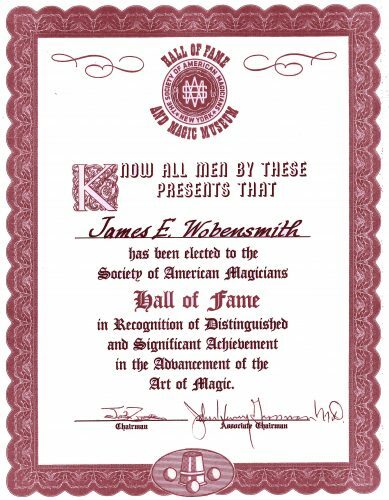 Moreover, James Chambers Wobensmith (1879-1973) was much more than Houdini’s patent attorney, he was a magician in his own right. 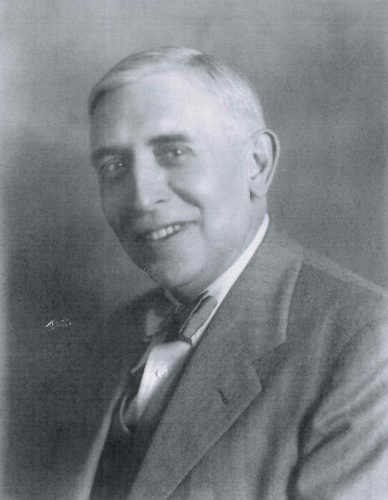 He founded the Philadelphia chapter of the Society of American Magicians and in 1930 was elected national president of the Society, immediately succeeding Houdini’s brother (Theo) Hardeen. 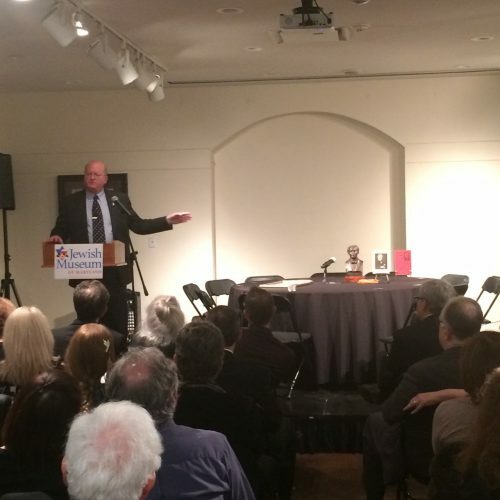 He was ultimately elected to the Society’s Hall of Fame. It also turns out that Wobensmith wasn’t just Houdini’s patent attorney, but the leading patent attorney for magicians in his time (including patenting tricks of the famous magician Thurston). 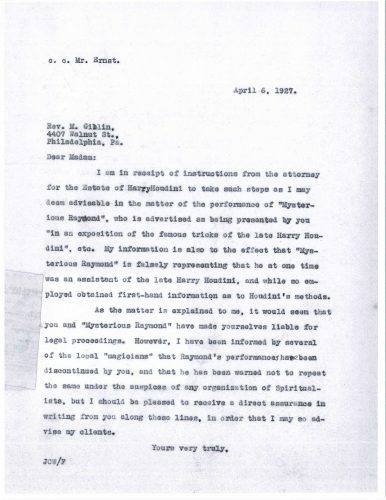 For the most part, Houdini avoided patenting his magic (he didn’t want to expose how his tricks were done). His work with Wobensmith was focused on more pragmatic technologies, such as his “easy escape” diving suit, featured in our exhibit, or film development processes (from the days when Houdini ran his own movie studio). Wobensmith was also a confederate in Houdini’s third act – his crusade against phoney mediums. 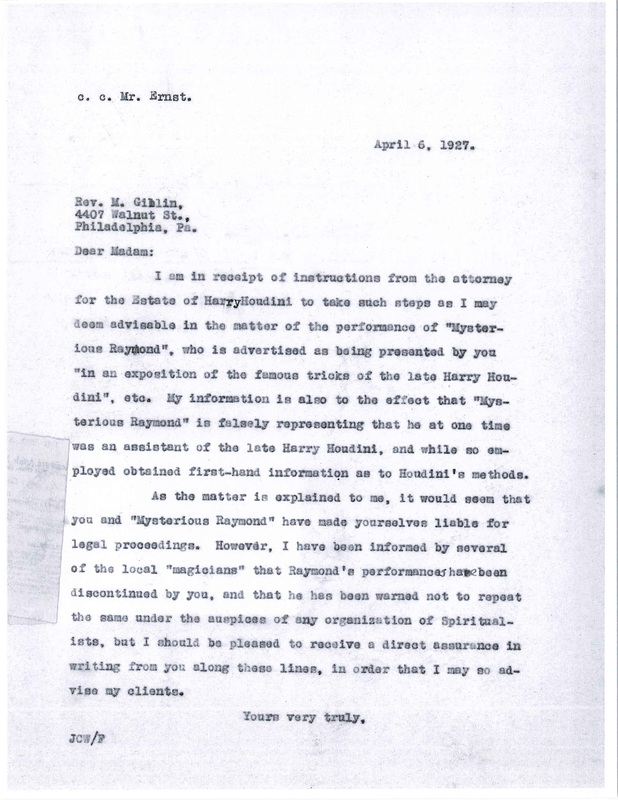 Wobensmith gave Houdini legal advice and even participated on stage in Houdini’s exposure of a particularly prominent Philadelphia Spiritualist. 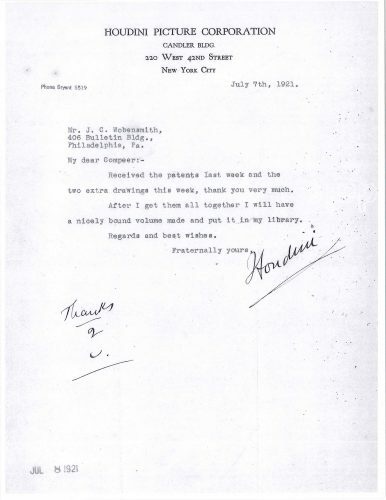 Remarkably, Wobensmith’s work on the project did not end with Houdini’s death in 1926. 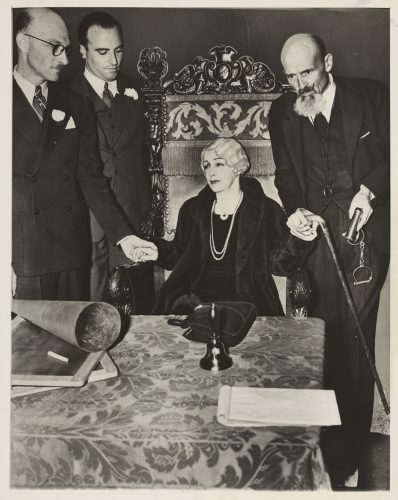 Mrs. Houdini (Bess) had offered a substantial reward to anyone who could bring her a message from her husband from the great beyond. Wobensmith stepped in to protect the estate from unscrupulous frauds like “the Mysterious Raymond” who tried to trick a grieving widow into awarding them the cash. “I can’t give up the idea of someday hearing definitely from him [Harry}. I suppose it is my early Catholic upbringing that makes me think perhaps the delay [in receiving a posthumous message from Harry] is penance for some act done long ago. I never make any decision without calling on Harry for help – I get an answer, maybe from my subconscious mind, which knows from long associations how he would act under certain conditions. They played many amusing games together [Bess and Houdini], which they never told for he was afraid of being thought sentimental. They had no children, so Houdini created a dream child, a son named after his own father Mayer Samuel. In their large New York home, he occupied the fourth floor, while his wife’s quarters were on the third. He sent her many letters by the maid about how the son was getting on. The letters only stopped when the son became President of the United States. 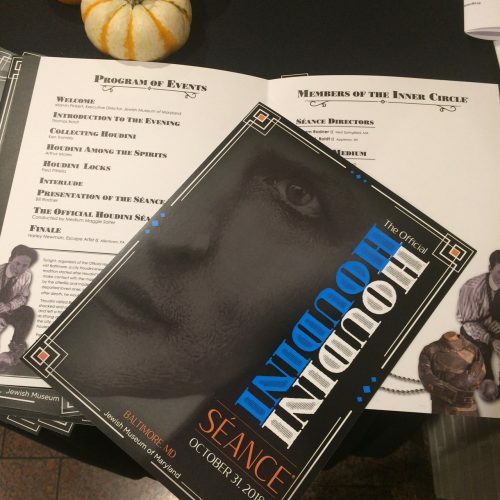 I closed the binder, thanked the Secretary of State, and as I exited I thought “how improbable was this encounter?” to learn something about the mind of Harry Houdini in a government office in Annapolis… it seemed about as likely as running into a Jewish magician at Artscape and deciding to create an exhibit! As many of you may know, the Jewish Museum of Maryland is opening Inescapable: The Life and Legacy of Harry Houdini. 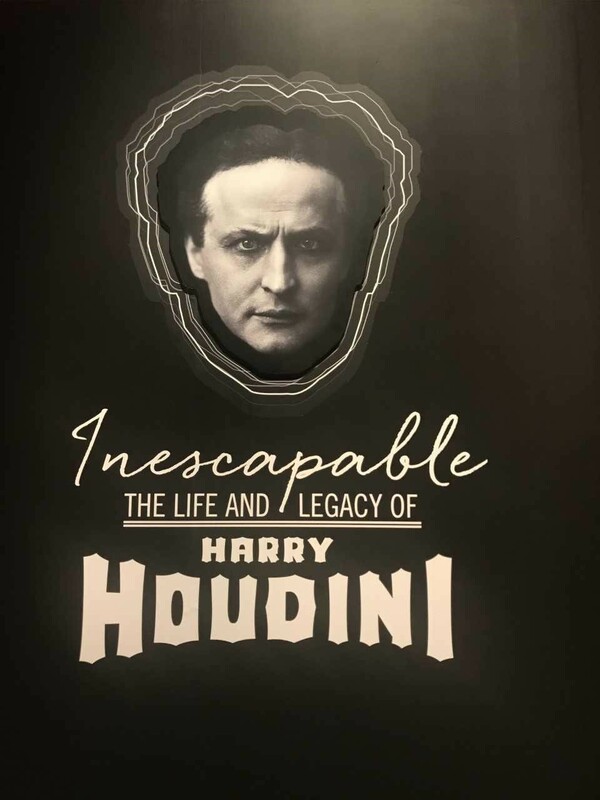 This exhibit puts Houdini’s story in a new perspective that most people do not know. Houdini’s Jewish legacy. Before coming to the Jewish Museum of Maryland and learning about the upcoming exhibit I did not know that Houdini was Jewish, which surprised me. 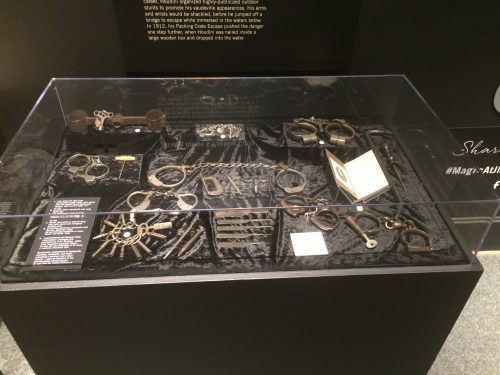 The exhibit connects Houdini’s Jewish heritage, his life’s work, and Maryland through artifacts such as newspapers, his straitjacket, and his shackles. This week one of the other interns and I had the amazing opportunity to help set up this magical exhibit. We were given the opportunity to set up the case for Houdini’s shackles and part of his lock pick set. Before starting to set up the case, we selected the fabric we were going to work with, which was a black velvet that went with the color scheme of the exhibit. Afterwards, we saw the different artifacts we were working with, which gave us an idea of the possible layout we were going to create. To better present and add dimension to the case, we decided to elevate with props several of the artifacts. 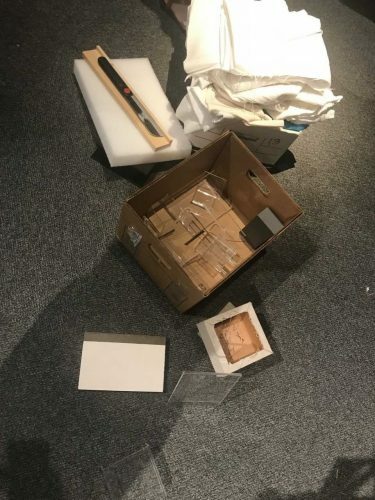 When creating the case, the artifacts that were heavier and bigger were put on the back of the case while the smaller ones were set up on the front. By doing this, the visitor can see the multiple artifacts without having to hover over the exhibit case. An example of the smaller artifacts in the front of the case would be the lock pick set. 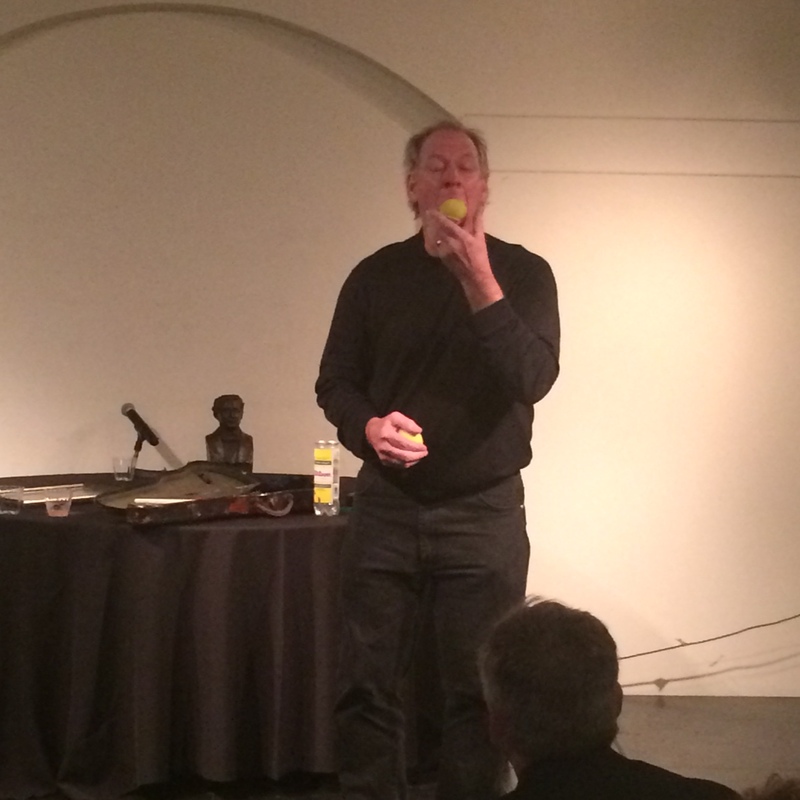 The set was placed in front of the case in a line, so the visitor could better compare each of the tools Houdini used. So, it can be better appreciated on the right of the lock pick set, we placed a hair pin that Houdini also used to open locks. After we finished setting the artefacts on the table we began to adjust some of them to improve the case’s presentation and make space for the labels. We also decided to move some of the artifacts, so the case could have a good contrast. 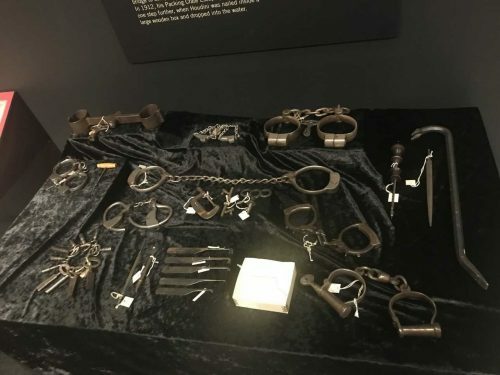 From the exhibit case we created, my favorite artifact was a pair of shackles that we set at the top left corner of the case. 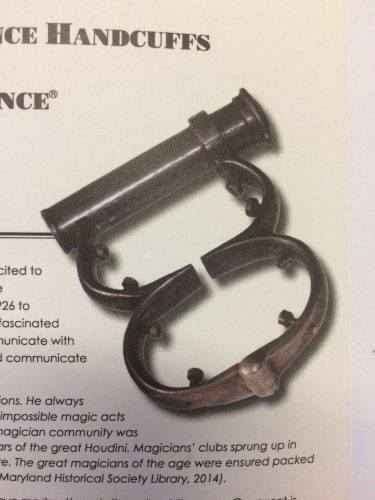 This pair of shackles were my favorite because they were the most unique from the collection. The shackles are rigid, oxidized, and cannot bend, but the most interesting thing from the shackles is their key. What intrigues me the must of the key is the “H” that it has on the middle to indicate the shackles were Houdini’s. This small detail, which may not be noticeable at the beginning, makes the shackles stand out. 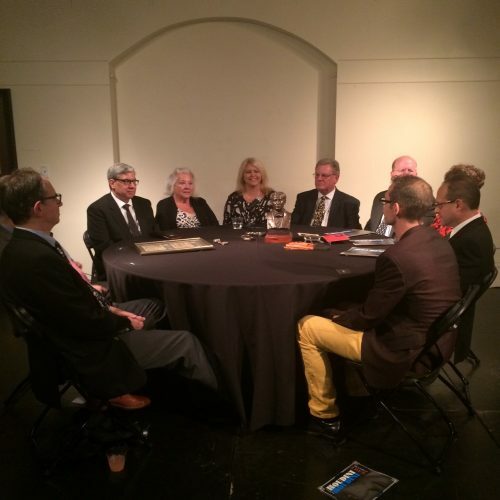 Participating on the creation of the Houdini exhibit was an amazing experience. 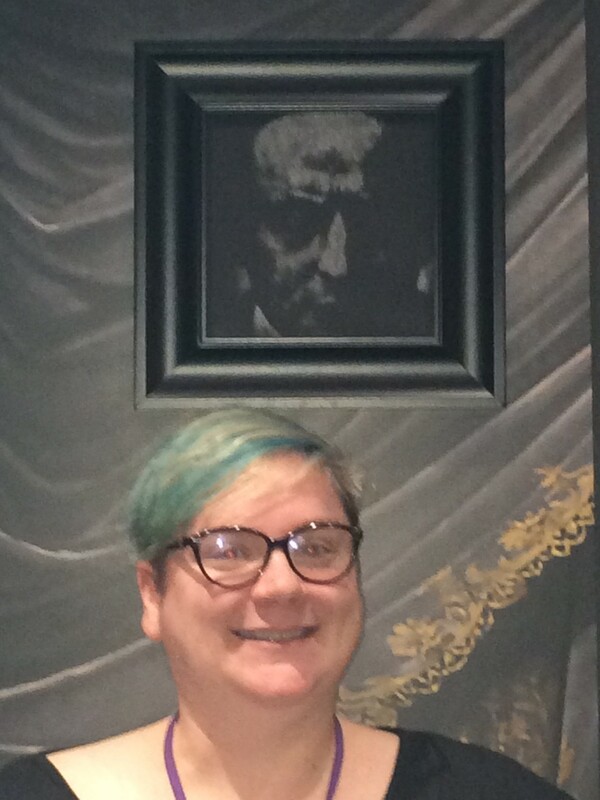 Being able to work behind the scenes of an exhibit and with artifacts that belonged to Houdini is an incredible honor. 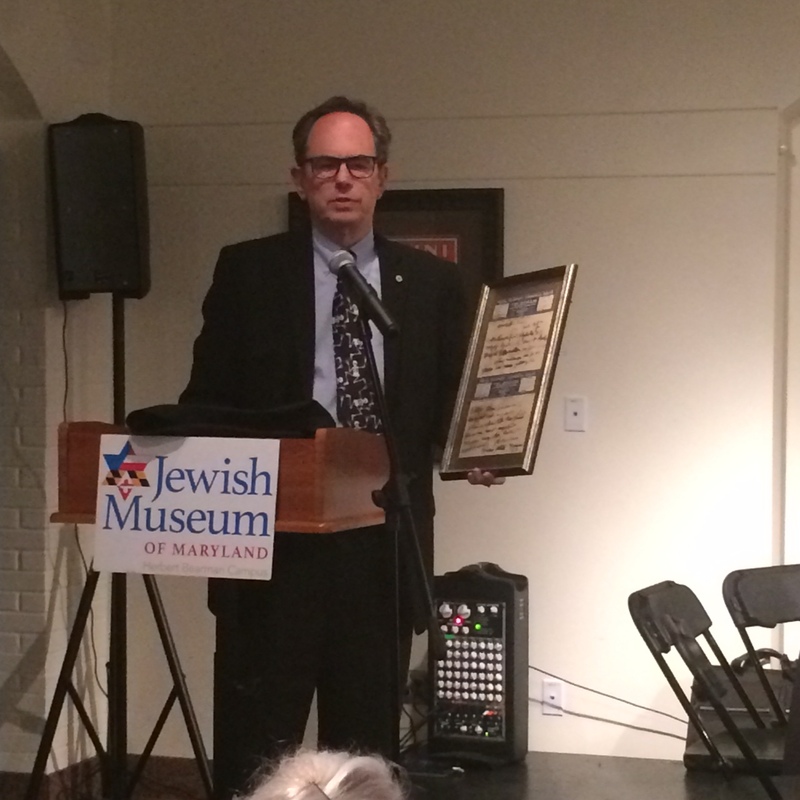 This exhibit creates a new narrative encompassing Houdini’s Jewish heritage and his connection with Maryland. Anyone that goes to see the exhibit will have an astonishing time.